Jason Poquette, R.Ph., writes: "One of the many things they don't teach very well in pharmacy school is career management. Don't misunderstand me. That wasn't a bitter jab at pharmacy schools or the professors who often give 150 percent of themselves, investing untold hours above and beyond the call of duty into the lives and careers of their students. But every professional program has its limits." 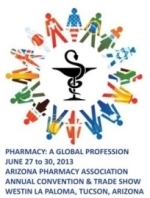 See you all in Tucson at the Westin La Paloma Resort & Spa for the 2013 AzPA Annual Convention & Trade Show. Walk-in registrations available on site. Patients leaving The University of Arizona Medical Center hospitals have been experiencing problems getting their prescriptions for controlled substances filled at some local pharmacies. The problem seems to occur for Medicare patients who receive a prescription from one of our medical residents. With the July 1 scheduled implementation of Medicare's so-called competitive bidding and National Mail Order program for diabetes test supplies fast approaching, the National Community Pharmacists Association is urging lawmakers to support HR 2375, recently introduced legislation that would delay the programs until a number of issues can be resolved. Lower-cost generic drugs can save patients millions in medication costs, but only if they make it to pharmacy shelves. A Supreme Court ruling that gives the Federal Trade Commission greater license to scrutinize deals made between pharmaceutical companies and the generic manufacturers that challenge them could push generic drugmakers to think twice before launching efforts to market their medications. Hospitals and patients both benefit when pharmacists work alongside physicians in the community hospital setting, according to the results of a study presented at the American Society of Health-System Pharmacists summer meeting in Minneapolis. The study, which was conducted from Feb. 4 to March 1 at Mission Hospital, a 735-bed community teaching hospital in Asheville, N.C., introduced a new practice model in which pharmacists and physicians worked as part of a team to deliver care. Does HELP bill go far enough? As the Senate Health, Education, Labor and Pensions Committee put the final touches on legislation that would give the FDA new powers to regulate pharmacy compounding, stakeholders issued mixed reviews on whether the bill does enough to ensure patient safety. Increased medication adherence not only improves patient outcomes but can also lower the overall cost of care in the United States, according to a review released by Avalere Health and funded by the National Association of Chain Drug Stores. Looking for similar articles? Search here, keyword MEDICATION ADHERENCE. Minority children are significantly less likely than their white peers to be diagnosed or treated for attention deficit hyperactivity disorder, new research shows. The study followed more than 17,000 children across the nation from kindergarten to eighth grade. Researchers regularly asked parents if their children had been diagnosed with ADHD. More than 1,200 oncology patients in five Canadian hospitals received diluted doses of gemcitabine and cyclophosphamide for a year or longer because labels on bags of premixed IV drug solutions prepared by an outsource compounding pharmacy did not make clear that the bags were intended for single individuals only, ongoing investigations have revealed. Healthcare costs caused by improper and unnecessary use of medications exceeded $200 billion in 2012, amounting to an estimated 10 million hospital admissions, 78 million outpatient treatments, 246 million prescriptions and 4 million emergency department visits annually, according to a new report from the IMS Institute for Healthcare Informatics. Two patients died within days after injection with an appropriate dosage of olanzapine pamoate, a long-acting formulation of the antipsychotic medication, FDA recently announced. Small-town pharmacist Robert McNeese was sentenced to more than five years in prison earlier this month. His crime: illegally dispensing oxycodone. Advance Pharmaceutical Inc. of Holtsville, N.Y., has recalled a single lot of enteric-coated aspirin tablets that may instead contain acetaminophen. A copy of the company's press release, dated June 19, states that the company received a complaint that one bottle of lot 13A206 contained 500-mg acetaminophen tablets, not aspirin. Nearly 70 percent of the people in Olmsted County, Minn., are taking at least a single prescription drug, and more than half are taking two, according to results from a new survey by Dr. Wenjun Zhong, from the Division of Epidemiology, Mayo Clinic, Rochester, Minn., and colleagues. Doctors don't have to automatically prescribe an antibiotic to treat children who appear to have acute sinus infections, according to new guidelines issued by a leading group of pediatricians. Instead, they can take a "watch and wait" approach if it appears the infection might clear on its own, according to the new American Academy of Pediatrics guidelines. Two patients died within days after injection with an appropriate dosage of olanzapine pamoate, a long-acting formulation of the antipsychotic medication, the FDA recently announced. According to the agency, both patients died three to four days after their injection and had very high levels of the drug in their bloodstream after death. A Boston University study shows for the first time that testosterone gel can decrease discomfort in men with pain syndromes and low testosterone levels who are chronic users of opioids. The men in the trial had pain conditions that ranged from headaches to backaches and had all become deficient in testosterone, a side effect of opioid use. During the study they used a transdermal testosterone gel or a placebo for three months, explained Dr. Shehzad Basaria, associate professor and director of the androgen clinical research unit at Boston University.